Figure 1: Five dimensions of competiveness Capital represents an essential economic asset in developing countries. Foreign Direct Investment (FDI) provided by MNCS contributes to a large extent to the flow of needed resources. Infrastructure is a key element to attract potential foreign investors. A poor infrastructure presents many impediments to progress. The host countries are often engaged in improving their infrastructure in terms of road building, telecommunication, easier access to some parts of the country, and so forth. Building Export capacity is very important for developing countries if they want to benefit fully from international trade and investment opportunities. Therefore, the government must seek to develop a regulatory framework that could assist local and regional areas in designing and implementing active policies for building export competitiveness. For example, many foreign companies in Thailand are offered to settle in a free trade zone, with some economic benefits and tax incentives, in order to facilitate exports. Technology development and work processes improvement needs differ greatly in developing countries, and even in some cases between regions. For example, Bangkok or the South of Thailand is more developed than some Northern areas. Building industrial capabilities requires technology cooperation between local and international companies, government and research/education institutions. For instance, in order to deliver state-of-the-art manufacturing technologies, basic services such as electricity, water, raw material and work practices, are needed before sustainable industries can be put in place. MNCs contribute greatly in providing the foundation for technological development and industrial growth providing examples to indigenous companies or subcontractors that might need to use state-of-the-art equipment or more efficient technology. Building Competence/skill of local workers has proved to be essential to the successful transfer and diffusion of technologies and knowledge. Whenever it is possible, MNCâ&#x20AC;&#x2122;s prefer to hire local people than use expatriate employees. However, the lack of an adequately skilled workforce in the operating region presents a challenge to overcome. Low education levels of potential employees are a particular impediment to maximizing a local employee base. MNCs are often engaged in capacity building efforts and sometimes deliver education and training to groups in order to help them increase production levels and to perform work routines more efficiently. There is a recognised need to adjust approaches to education and training based on local conditions and local knowledge and skill levels. There are clear benefits to engaging local based trainers, and thus local Universities should be seen by MNCs as a good pool of competences that will help ensure the sustainability of the technology transferred. Universities and R&D institutions understand the local context and possess the knowledge that is valuable to MNCs. As well, they should be considered as the right partners for conducting joint research projects for technology maintenance or improvement, leading in some cases to new and innovative products or services. However, although the recognised potential benefits of such partnerships between Thai Universities and MNCs exist, there are too few relationships, or they are strictly limited to providing some internship to students as part of a social contribution to the Thai society. Thus, our study seeks to better understand the above factors impacting the willingness of MNCs to establish research collabouration with local Universities and to exchange knowledge. Based on Figure 1, Technology Development and Work Processes, and Competences/Skills, are the two main dimensions contributing to play a significant role in enhancing the R&D capacity in Thailand. Toward this end, this paper seeks to empirically examine the factors which influence the intention of MNCs to share knowledge with Universities in Thailand. In addition, success factors and barriers to motivate MNCs to cooperate with Thai research and education institutions have been investigated. The present paper focuses on identifying organizational factors impacting the knowledge sharing process between Universities and MNCs. The next section of this paper presents a literature review on knowledge sharing concepts. Section three outlines the organizational context of study, and the adopted research methodology. The last section draws a model of MNC inclination to share knowledgewith a special focus to factors impacting Technology Development and Competences and Skills. 2. Background It is well recognised today that knowledge is one of the most competitive resources for the dynamic global business environment (Sharif et al., 2005). Indeed, in recent years companies have strongly focused on organising creating, transferring, searching, sharing Knowledge under the roof of so-called Knowledge Management (Hildreth P.J., 2002). On the other side, the multidisciplinary academic world such as philosophy, sociology, computer science have generated a large amount of publications on various perspectives and dimensions of knowledge management (Davenport T. H, 1996), (Davis J., 2002). It is acknowledged that knowledge sharing is a somewhat nebulous concept, very important for harnessing knowledge (Petersen N. J., 2002), (Little and Ray, 2002) and thus benefits from adopting a holistic approach. Studies have focused either on knowledge sharing between organizations (Husman and Brandt, 2001) or between units in a firm (Davis J., 2002). Knowledge sharing is not well defined in the literature partially because the research area has not been very active (Dixon, 2002), (Bircham-Connolly H, 2005). (Davenport T. H, 2000) define knowledge sharing as providing one’s knowledge to others as well as receiving knowledge from others (the supply side and the demand side of knowledge sharing). A more pragmatic description of knowledge sharing is “the process through which one unit is affected by the experience of another” (Argote et al., 2003). We adopt the following definition of (Willem and Scarbrough, 2002), “Knowledge sharing process is defined as exchange of knowledge between at least two parties in a reciprocal process allowing reshaping and sense-making of the knowledge in the new context”. Today many organizations are concerned about how organizational members share their knowledge and accordingly have set up some incentives to motivate them to make their knowledge available to the organization or to retrieve knowledge stored in the corporate repositories when needed (Gupta and Michailova, 2004). The literature shows that they are several models for knowledge sharing (Petersen N. J., 2002), (i) on one hand, sharing knowledge forms direct interactions between people as stated in Lederberg’s model involving informal presentation to colleagues and community reaction, or Nonaka and Takeuchi’s model (see Nonaka and Takeuchi, 1995) involving sharing tacit knowledge (e.g., through apprenticeship), and on the other hand (ii) with indirect interaction through document creation such as the drafting and delivering of reports. However analysis of knowledge sharing practices shows that reluctance to share is dominating the organizational reality (Husted and Michailova, 2002). Factors affecting the behaviour of knowledge sharing have been quite heavily investigated, (Constant et al. 1994), (Wasko et al. 2000), (Ardichvili et al., 2003), (Lee et al. 2003), (Politis 2003), however studies have focused either on social or technological dimensions, or concern individuals within the same organization. Knowledge sharing between multinational corporations and a host country through local education and research institutions, the aim of this research, has not yet been investigated. Our research study focuses to investigate the willingness of automotive industry multinational corporations to share knowledge with Thai Universities. 3. Case study of automotive industries in Thailand 3.1 Context of study Most of the developing countries consider that the automotive industry will move the country toward an intensive industrialisation by creating a large set of related businesses. Thailand aims to be regarded as the Detroit of Asia. The country has engaged in the last few decades in the development of the automotive industry, with a special focus on domestic auto-assembly. Thailand is the world's second largest pick-up truck market after the U.S., and it is ASEAN's largest automotive market and assembler. Today all leading Japanese car producers as well as BMW, Mercedes Benz, General Motors, Ford, Volvo, and Peugeot, assemble cars in Thailand along with their group of subcontractors and suppliers. Thailand has become the main production base for auto exports in South East Asia. Thailand is considered as one of the most attractive countries for automotive investments mainly due to factors such as the good and growing domestic market size, the relative political stability, liberal trade and investment policy, and the lack of a "national car program". The automotive industry is Thailand's third largest industry, employing an estimated total workforce of about 225,000 employees, and with a total production capacity of around 1,270,100 cars and trucks per year. Japanese-make automobiles have dominated the local auto market; with nearly 90% market share but other global vehicle manufacturersâ&#x20AC;&#x2122; investments are growing consistently, creating a very dynamic industry. New global parts manufacturers are in the process of relocating some of their operations to Thailand. Thailand has 16 vehicle assemblers; most of them are large-scale foreign owned or joint venture enterprises. As well, there are more than 1100 small and medium sized companies working as suppliers of original equipment (OEM), or producing replacement equipment (REM). The automotive industry in Thailand is very concentrated with most of the factories located in the Samut Prakarn province (approximately 20 km south of Bangkok), followed by Rayong (approximately 130 km south-east of Bangkok). The largest car producer is Toyota, and in 2003 it was the first manufacturer to establish a local R&D centre in Thailand. However, this type of initiative, a cooperative arrangement between MNCs and local universities, is so far not a widespread practice in Thailand. Therefore, there is a stringent need to understand the mechanisms allowing for knowledge transfer and sharing, if Thailand wants to position itself as a very competitive country, not only in the automotive industry but in other industrial sectors as well. 4. Methodology of study Knowledge sharing is a context-embedded process, making its measurement difficult, and there is so far no standard method to measure the sharing process. With the aim of understanding the knowledge flow/transfer and the learning processes between foreign companies and local Universities, we have undertaken a qualitative approach. Several focused and semi structured interviews have been conducted with different managers from automotive companies and from people working at universities. The aim was to identify the current situation in terms of University-Industry (UI) relationships and to investigate the indicators or mechanisms contributing to the increase of the willingness of automotive companies to share their knowledge with Thai Institutions. Table 2 shows that five variables are supported by our hypothesis: Top executive decision, the number of years in Thailand, the important level of R&D strategy, the level of confidential information, and the level of benefits shows significant impact to the intention to share knowledge. Compared to the previous table, top executive decision-making and the importance of R&D adopted strategy, play a crucial role in the intention to share tacit knowledge that is considered a more rigorous activity. Sharing tacit knowledge implies the need to put actively in place some strategies such as personalisation. For example, networking is important and requires more time from both parties. Therefore, the strong involvement of leadership in the decision making is crucial for a successful collabouration with universities. In addition, companies that have a clear focus on engaging R&D efforts are more prone to share their tacit knowledge. Model KSI Based on the interviews, literature review and the results of the conducted surveys, we have identified several dimensions that could impact the knowledge sharing intention (KSI) of multinational corporations with Thai universities or research institutions. The four dimensions rely strongly on the type of shared knowledge, the level of confidentiality and the Universities perspectives (absorptive capacity). These factors were strongly highlighted by the interviewed leaders. The following figures summarize the key finding. priorities of personnel managers and labour leaders. Conflicting interests of the stakeholders can be so acute that it will hamper the knowledge sharing intention. As well, political stability and dedicated laws and regulation can increase the willingness of MNCs to cooperate more freely. 5. Conclusion Knowledge Management is a new inter-disciplinary strategy in today’s business world. It is well recognized that knowledge is an important asset for organizations. Making the most value from employees’ knowledge is an important element of a resource-based strategy for firms. In addition, firms create and acquire new knowledge in many ways such as in-house or outsource R&D. Knowledge sharing between firms and Universities has been always considered as a challenging task. This statement is even more valid for emerging or developing countries such as Thailand. 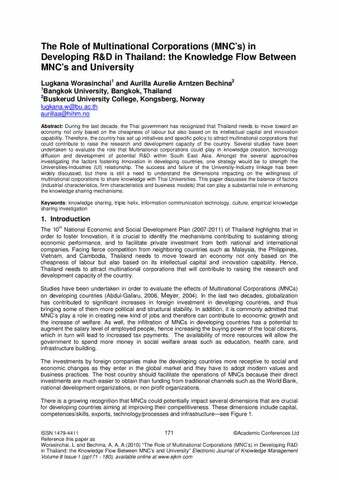 In this paper, we have discussed the effects that Multinational corporations could have on technology diffusion and development of potential R&D within Thailand. Although the Thai government has implemented policy in order to foster and attract R&D based Foreign Direct Investment (FDI). Our study have highlighted that there are still barriers impeding the fluidity of knowledge sharing between multinational corporations and Thai universities. We have conducted a cross-methodologies based on qualitative and quantitative approaches to collect data. Based on the analysis of the data, we have delineated a model of intention to share both implicit and explicit knowledge of MNC’S with Thai Universities and research institutions. The knowledge sharing intention depends of 4 elements such business characteristics, the perceived benefits, capacity to absorb information or the usability of the knowledge and socio-technical environmental political factors. Relation between factors such as industrial characteristics, firm characteristics and business models and how they could play substantial role in the knowledge sharing mechanisms has been closely investigated. However, analysis and interpretation (Hermeneutics) of collected data are subject to the cognitive skill and the current thinking of the researcher/observer. Accordingly, the elabourated model does not definitely reflect all the aspects and dimensions of this highly complex area of Knowledge sharing and learning mechanisms. Furthermore the selected indicators might enlighten only some perspectives of those mechanisms. Therefore further research works should be conducted in order to confirm or refute the result of our study. This will be done by completing our study, with further analysis of the collected data. In addition, we intend to expand the study to other industries in Thailand. Husted, K. & Michailova, S. (2002) Diagnosing and fighting knowledge sharing hostility. Organizational Dynamics, 31, pp 60-73. Little, P. & Ray, C. (2002) Managing knowledge. London SAGE Publication LtD. Meyer, K. E. (2004) Perspectives on Multinational Enterprises in Emerging Economies. Journal of International Business Studies, 35, pp.259-276. Petersen N. J., P., F. (2002) Developing Knowledge and Value in Management Consulting. IN BUONO, A. F. (Ed.) Research in Management Consulting. Greenwich: Information Age Publishing, (ed. ): 2002., Greenwich: Information Age Publishing. Sharif, M. N., Zakaria, N., Lim Shu Ching, N. & Low Soh Fung (2005) Facilitating Knowledge Sharing Through Lessons Learned System. Journal of Knowledge Management Practice. Willem, A. & Scarbrough (2002) Structural effects on inter-unit knowledge sharing: The role of coordination under different knowledge sharing needs. 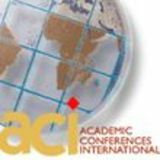 3rd European conference on Organisational Knowledge, learning and capabilities. Athens.